Like in many African countries, recognition of indigenous rights has never been a point on Angola's political agenda. A policy of this type is not in keeping with the project of nationalization in this culturally diverse country, and it was believed that it could trigger ethnic conflicts. 'Um só povo, uma só nação' (one people, one nation), was always the motto. Moreover, all black Africans were considered indigenous; the process of emancipation focused on being freed from the bonds of colonization. But of all the population groups in Angola, the San have suffered the most from the war that lasted nearly thirty years and that came to an end in 2002. The South Africans who violently invaded southern Angola in the 1980s used the San as trackers during their military expeditions. The war also robbed the San of their traditional existence as hunters and collectors. Discrimination made their isolation complete. "Other peoples believe that the San bring bad luck," explains Benedicto Paulo of Ocadec, an Angolan organization that has been concerned with the fate of the San since 2001. "They do not want them entering a kimbo - a traditional village - because this is believed to make their cattle barren. The word San is now a cuss word. This discrimination often leads to a tendency to flee, often in alcohol, and to hide. The San are a traumatized people with many social problems." 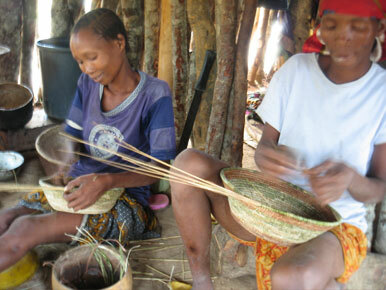 Ocadec performed a study of the living conditions of 3500 !Xun San in southern Africa. The results of the study were presented to the government, leading to a delegation's visit to San communities and the promise to develop a policy to protect this population group. The study was documented in Where the First are the Last, a documentary by Namibian filmmaker Richard Pakleppa. Ocadec has joined the regional network, Wimsa.